The story of advocacy is made up of many small triumphs. Some of these are a long time coming, requiring courage and perseverance: some are short but highly dramatic. Each is a vital step in ensuring freedom of religion or belief for all. Here are a few examples of CSW’s more recent triumphs. The beginning of May 2017 saw not one but two amazing answers to prayer. 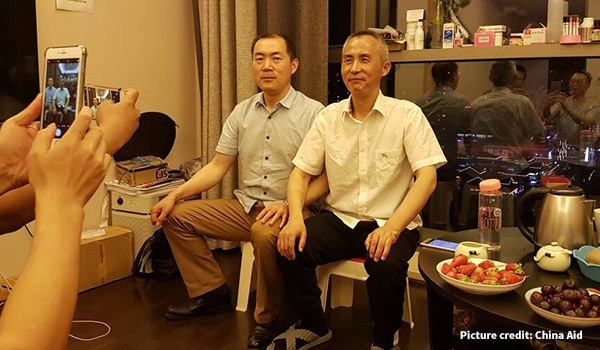 On 9 May Chinese human rights lawyer Li Heping was released and returned to his family, who hadn’t seen him in nearly two years. Just two days later we got the news of the release of Rev Hassan and Mr Abdumawla, two Sudanese men held in a maximum security prison on unjust charges. Li Heping was released just two days after CSW supporters joined in prayer for him when he was given a suspended sentence. Li was imprisoned two years ago as part of the Chinese government crackdown on human rights defenders. Over 300 human rights defenders, as well as their friends, family and colleagues, have been detained, harassed or even disappeared. We’ve been campaigning for Li since his detention, and in October 2016, we presented a petition with 2,148 signatures to the Chinese Embassy in London, calling for his release. If you prayed for Li, signed the petition, or generously donated: thank you! The week Li was released, there was one more surprise to come: the release of Rev Hassan and Mr Abdumawla in Sudan. These men, along with two others, Rev Kuwa and Mr Jašek, were charged with national security crimes in August 2016, after being arrested almost a year earlier. In reality, their only crime had been raising money to treat a young man who’d been badly burned in a student protest. Rev Kuwa was found innocent of all charges and released in January 2017. Mr Jašek received a presidential pardon and was freed in February, and in May Mr Abdumawla and Rev Hassan were released after receiving a presidential pardon. Thousands of supporters like you rallied behind these men magnificently. Over 700 supporters tweeted senior EU officials about the case, and almost 5,000 emails were sent to Sudanese embassies around the world asking for the men to be released! Pastor Omar Gude Perez is the leader of the Apostolic Movement in Cuba, a network of independent Cuban churches that aren’t controlled by the government. 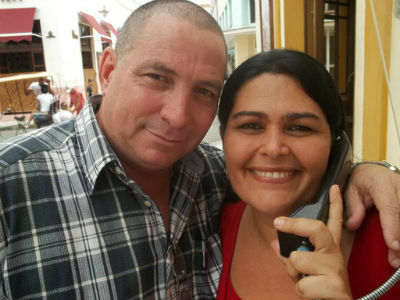 Because the Apostolic Movement isn’t controlled by the state, the Cuban Government sees them as a threat and as a consequence of this, Pastor Gude Perez was arrested in 2008 on falsified charges including accusations of human trafficking. Pastor Gude Perez received a sentence of six years, however, that was when the international campaign kicked into gear. CSW made the case a priority, and mobilised our contacts in the United States and EU to ensure that Omar received medical attention for his high blood pressure while in prison, as well as weekly monitoring calls from EU representatives and, eventually, an offer of asylum in the United States. In 2011, he was released on conditional liberty. The US offered Pastor Gude Perez, his wife Kenia, and their two children asylum, however this wasn’t the end of their story. It proved very difficult for the Perez family to gain permission to leave the country, and it was only in 2013 that they were finally able to arrive in the US as refugees. However, Pastor Gude Perez wasn’t the only person suffering as a result of his involvement with the Apostolic Movement. His wife, Kenia Denis, also suffered harassment, danger and discrimination. During his imprisonment, Kenia, who was allowed to visit him once every three weeks, complained that she was harassed by the guards when she visited. She was also repeatedly threatened by the authorities with the confiscation of their home which they own. She said she was told by a number of officials that the threats and harassment were a punishment for speaking to international human rights organisations about Pastor Gude Pérez’s situation. In November 2011 Kenia visited Washington DC in a last-ditch attempt to raise support for her family’s application for asylum, despite knowing that drawing attention to herself in this way made it very unlikely that she would be able to return to her husband and children. The granting of asylum is believed to be in part due to CSW's coverage of their case. While Pastor Gude Perez was in prison he received weekly monitoring calls from EU representatives as a result of CSW's advocacy. CSW also mobilised prayer and solidarity for the whole family. His family received hundreds of cards of encouragement from CSW supporters. Brought Cuban pastor Carlos Lamelas to Washington DC, the first time a Cuban Protestant pastor had ever been to Washington to raise concerns about freedom of religion or belief. Used our influence at the EU to urge the European External Action Service and the Austrian Ministry of Foreign Affairs to raise religious freedom violations as a key part of their dialogue with Cuban authorities.